I must admit that I knew very little about Chartwell before our visit. I knew that it was one of the places that Ray wanted to visit...and that Winston Churchill lived there. When we arrived I was taken aback by the beauty of the grounds. I hope the pictures show a fraction of the beauty. Chartwell remains much like it was when Churchill lived there. It felt like a home, unlike the museum atmosphere of Hever Castle (and all of the other castles we visited). It would not have surprised me to have seen Winston, holding a cigar, sitting at his desk with a cat watching him work...or maybe painting another scene of this beautiful estate. I think they said that people played croquet here. Churchill liked animals...especially cats. One special feline was Jock. There was a sign that said to be on the lookout for Jock. I did not see Jock roaming the house, but I sure did search for him. When Churchill was 88, Sir John Colville (nick named Jock) gave him a marmalade cat. Of course, the kitty was named, Jock. It is said that there are pictures of Jock sitting on Churchill's lap at a number of family occasions...one being his grandson's wedding. Jock often sat on the bed next to Churchill and was there when he died at the age of 90. I found this picture of Jock on Jock's Facebook! Jock remained a family pet until he was 13 and was buried in the pet cemetery at Chartwell. 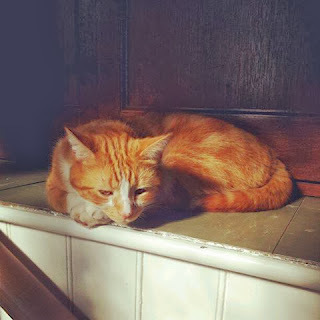 Chartwell was left to the government with the stipulation that a marmalade cat would always live there...and of course, its name would be Jock. One of the docents told us that during Hitler's Blitz, it was known to not destroy Chartwell. He intended to move there after he defeated Churchill. Hitler knew how special this place was to Churchill. It was his refuge, where he painted and wrote, and where he could be with his family. It is so fortunate that it was not damaged during The Blitz. I want to visit Chartwell again. I now see Winston Churchill through different eyes...as a family man, artist, lover of animals...especially his felines and of course, a great world leader.